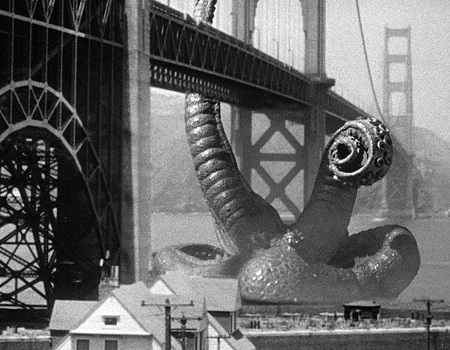 On the other hand, the giant octopus that serves as the big bad in Robert Gordon's It Came From Beneath the Sea can trace its origins directly to human, scientific meddling. Hydrogen bomb testing over the Philippine Trench, one of the third deepest points in the world, forces the voracious cephalopod out of its natural habitat and mutates it to gargantuan proportions; like any super-sized carnivore, it quickly begins sinking ships and devouring swimmers, leaving it up to the US Navy to save the day. It Came From Beneath the Sea is every bit as cheesy as anyone could expect to be, and maybe even cheesier, but it's a ton of fun thanks to its hopelessly dated and relentlessly (unintentionally?) suggestive dialogue. Of course, what really makes the film worth seeing is the stop-motion effects work of the legendary Ray Harryhausen. While this is no Clash of the Titans or Jason and the Argonauts, it's still a wonderful showcase for his brilliance as a visual effects artist.